High-speed, slow-motion video of a xenon flashtube. Camera was recording at 44,025 frames per second. A xenon arc lamp is a specialized type of gas discharge lamp, an electric light that produces light by passing electricity through ionized xenon gas at high pressure. It produces a bright white light that closely mimics natural sunlight. Xenon arc lamps are used in movie projectors in theaters, in searchlights, and for specialized uses in industry and research to simulate sunlight. Xenon headlamps in automobiles actually use metal-halide lamps where a xenon arc is only used during start-up. Each consists of a fused quartz or other heat resistant glass arc tube, with a tungsten metal electrode at each end. The glass tube is first evacuated and then re-filled with xenon gas. For xenon flashtubes, a third "trigger" electrode usually surrounds the exterior of the arc tube. The lifetime of a xenon arc lamp varies according to its design and power consumption, with one major manufacturer quoting average lifetimes ranging from 500 hours (7kW) to 1,500 (1kW). Xenon short-arc lamps were invented in the 1940s in Germany and introduced in 1951 by Osram. First launched in the 2 kW size (XBO2001), these lamps saw wide use in movie projection, where they replaced the older, more labor intensive (to operate) carbon arc lamps. The white continuous light generated by the xenon arc is spectrally similar to daylight, but the lamp has a rather low efficacy in terms of lumens of visible light output per watt of input power. Today, almost all movie projectors in theaters employ these lamps, with power ratings ranging from 900 watts up to 12 kW. Omnimax (Imax Dome) projection systems use single xenon lamps with ratings as high as 15 kW. As of 2016, laser illumination for digital theater projectors, is starting to establish a market presence  and has been predicted will supersede the xenon arc lamp for this application. All modern xenon short-arc lamps use a fused quartz envelope with thoriated tungsten electrodes. Fused quartz is the only economically feasible material currently available that can withstand the high pressure (25 atmospheres for an IMAX bulb) and high temperature present in an operating lamp, while still being optically clear. The thorium dopant in the electrodes greatly enhances their electron emission characteristics. Because tungsten and quartz have different coefficients of thermal expansion, the tungsten electrodes are welded to strips of pure molybdenum metal or Invar alloy, which are then melted into the quartz to form the envelope seal. Because of the very high power levels involved, large lamps are water-cooled. In those used in IMAX projectors, the electrode bodies are made from solid Invar and tipped with thoriated tungsten. An O-ring seals off the tube, so that the naked electrodes do not contact the water. In low power applications the electrodes are too cold for efficient electron emission and are not cooled; in high power applications an additional water cooling circuit for each electrode is necessary. To save costs, the water circuits are often not separated and the water needs to be deionized to make it electrically non-conductive, which, in turn, lets the quartz or some laser media dissolve into the water. Perspective view of 3 kW lamp showing plastic safety shield used during shipping. In order to achieve maximum efficiency, the xenon gas inside short-arc lamps is maintained at an extremely high pressure — up to 30 atmospheres (440 psi / 3040 kPa) — which poses safety concerns. If a lamp is dropped, or ruptures while in service, pieces of the lamp envelope can be thrown at high speed. To mitigate this, large xenon short-arc lamps are normally shipped in protective shields, which will contain the envelope fragments should breakage occur. Normally, the shield is removed once the lamp is installed in the lamp housing. When the lamp reaches the end of its useful life, the protective shield is put back on the lamp, and the spent lamp is then removed from the equipment and discarded. As lamps age, the risk of failure increases, so bulbs being replaced are at the greatest risk of explosion. Because of the safety concerns, lamp manufacturers recommend the use of eye protection when handling xenon short-arc lamps. Because of the danger, some lamps, especially those used in IMAX projectors, require the use of full-body protective clothing. Output profile of a xenon arc lamp. Xenon short-arc lamps come in two distinct varieties: pure xenon, which contains only xenon gas; and xenon-mercury, which contains xenon gas and a small amount of mercury metal. 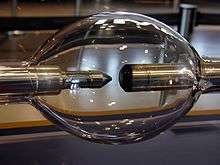 In a pure xenon lamp, the majority of the light is generated within a tiny, pinpoint-sized cloud of plasma situated where the electron stream leaves the face of the cathode. The light generation volume is cone-shaped, and the luminous intensity falls off exponentially moving from cathode to anode. Electrons passing through the plasma cloud strike the anode, causing it to heat. As a result, the anode in a xenon short-arc lamp either has to be much larger than the cathode or be water-cooled, to dissipate the heat. The output of a pure xenon short-arc lamp offers fairly continuous spectral power distribution with a color temperature of about 6200K and color rendering index close to 100. However, even in a high pressure lamp there are some very strong emission lines in the near infrared, roughly in the region from 850–900 nm. This spectral region can contain about 10% of the total emitted light. Light intensity ranges from 20,000 to 500,000 cd/cm2. An example is "XBO lamp", which is an OSRAM trade name for pure xenon short-arc lamp. For some applications such as endoscopy and dental technology light guide systems are included. In xenon-mercury short-arc lamps, the majority of the light is generated in a pinpoint-sized cloud of plasma situated at the tip of each electrode. The light generation volume is shaped like two intersecting cones, and the luminous intensity falls off exponentially moving towards the centre of the lamp. Xenon-mercury short-arc lamps have a bluish-white spectrum and extremely high UV output. These lamps are used primarily for UV curing applications, sterilizing objects, and generating ozone. The very small size of the arc makes it possible to focus the light from the lamp with moderate precision. For this reason, xenon arc lamps of smaller sizes, down to 10 watts, are used in optics and in precision illumination for microscopes and other instruments, although in modern times they are being displaced by single mode laser diodes and white light supercontinuum lasers which can produce a truly diffraction limited spot. Larger lamps are employed in searchlights where narrow beams of light are generated, or in film production lighting where daylight simulation is required. All xenon short-arc lamps generate substantial ultraviolet radiation. Xenon has strong spectral lines in the UV bands, and these readily pass through the fused quartz lamp envelope. Unlike the borosilicate glass used in standard lamps, fused quartz readily passes UV radiation unless it is specially doped. The UV radiation released by a short-arc lamp can cause a secondary problem of ozone generation. The UV radiation strikes oxygen molecules in the air surrounding the lamp, causing them to ionize. Some of the ionized molecules then recombine as O3, ozone. Equipment that uses short-arc lamps as the light source must contain UV radiation and prevent ozone build-up. Many lamps have a shortwave UV blocking coating on the envelope and are sold as "ozone free" lamps for solar simulators applications. The company WACOM has also a long history of xenon lamp production. Some lamps have envelopes made out of ultra-pure synthetic fused silica (such as "Suprasil"), which roughly doubles the cost, but which allows them to emit useful light into the vacuum UV region. These lamps are normally operated in a pure nitrogen atmosphere. Xenon short-arc lamps also are manufactured with a ceramic body and an integral reflector. They are available in many output power ratings with either UV-transmitting or blocking windows. The reflector options are parabolic (for collimated light) or elliptical (for focused light). They are used in a wide variety of applications, such as video projectors, fiber optic illuminators, endoscope and headlamp lighting, dental lighting, and search lights. Xenon short-arc lamps have a negative temperature coefficient like other gas discharge lamps. 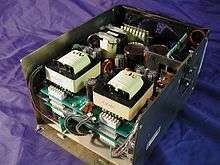 They are operated at low-voltage, high-current, DC and started with a high voltage pulse of 20 to 50kV. 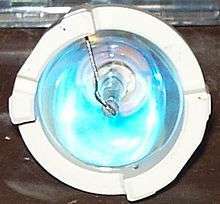 As an example, a 450 W lamp operates normally at 18 V and 25 A once started. 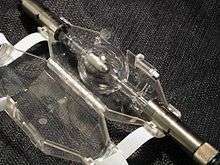 They are also inherently unstable, prone to phenomena such as plasma oscillation and thermal runaway. Because of these characteristics, xenon short-arc lamps require a proper power supply. In 1991 "xenon headlamps" were introduced for vehicles (BMW E32). These are actually metal-halide lamps; the xenon gas is used only to provide some light immediately upon lamp startup, as required for safety in an automotive headlamp application. Full intensity is reached 20 to 30 seconds later once the salts of sodium and scandium are vapourised by the heat of the xenon arc. The lamp envelope is small and the arc spans only a few millimetres. 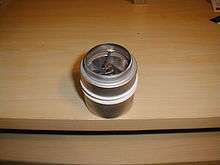 An outer hard glass tube blocks the escape of ultraviolet radiation that would tend to damage plastic headlamp components. The first xenon headlamps contained mercury; newer types do not. These are structurally similar to short-arc lamps except that the arc-containing portion of the glass tube is greatly elongated. When mounted within an elliptical reflector, these lamps are frequently used to simulate sunlight. Typical uses include solar cell testing, solar simulation for age testing of materials, rapid thermal processing, and material inspection. ↑ "Ushio - product data page". ↑ "Christie announces installation of laser projectors". ↑ "Example of article discussing laser illumination replacing the xenon arc". 1 2 "OSRAM SYVLANIA XBO" (PDF). 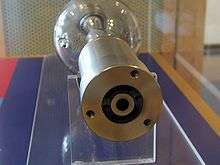 Wikimedia Commons has media related to Xenon arc lamp.